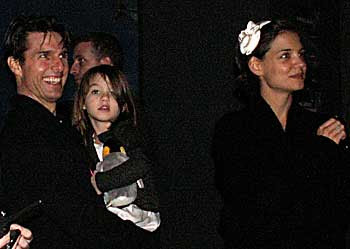 The Cruise Family was spotted at the Melbourne Aquarium on Tuesday, 2. In the Antarctica exhibit Suri marveled at the King and Gentoo penguins, while at the Rockpool Cruise, Holmes and Suri all held a starfish. Suri was a bit quieter when they went downstairs into the main Oceanarium, which is home to a number of 10-foot sharks and massive stingrays. Unfortunately, only this one picture is available, so its hard to tell what Suri is wearing.. i can only guess that she has a white silk dress on..